At a recent REL 360 Movie Night, Dr. Ramey chose to show us a Bollywood romantic comedy that heavily featured Gandhi. 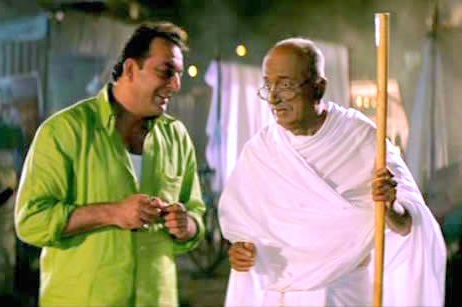 The film, Lage Raho Munna Bhai, follows the transformation of a violent thug into a follower of Gandhi’s nonviolent ethics as he pursues a lovely radio host. It’s an adorable story, but at the same time, it evokes some interesting discussion regarding the deification of prominent figures. In the movie, Gandhi appears as a sort of apparition to the main character. He is regarded in an almost god-like way, with many of the characters referring to him and his teachings with an air of infallibility. At one point, Gandhi tells the main character a story of Gandhi’s youth in which he stole from his brother. The main character is shocked to hear this—how could Gandhi steal? It’s as though Gandhi is not considered to be an ordinary human being; he is treated as something far superior. Gandhi, in this way, has been deified. This made me think about other people whom we tend to put on a pedestal. As a scholar of not only Religious Studies, but also American Studies and History, my mind immediately jumped to the Founding Fathers. Who is placed higher on the American pedestal than George Washington, Thomas Jefferson, and good ol’ Honest Abe? (Lincoln is not typically included in lists of Founding Fathers, but he is still frequently invoked as a moral example alongside Washington, Jefferson, and others). American society looks back upon these men as the quintessential Americans. Their honorable traits are emphasized—and perhaps, to some extent, exaggerated—while their questionable traits are minimized or completely ignored. These men are thought to embody the ideal culture of the United States, and they are often lifted to a position of godlike nature. In the same way, Lage Raho Munna Bhai painted a portrait of Gandhi that made him the “ideal Indian”. The rhetoric of the film continually criticized the current bureaucratic and seemingly corrupt state of India, saying instead that Gandhi had it right. Gandhi, then, stood for everything that is good and everything that is truly Indian. Gandhi, with all of his goodness and infallibility, became deified just as the Founding Fathers do in America. But who deifies him, and for what reasons? Who says what is “truly Indian” or what is India’s moral standard? Perhaps no one person can determine who is remembered throughout history, but people can certainly utilize these figures for their own ends—something that happens in America regularly. There is a certain national, historical narrative that also becomes the moral narrative. Honest Abe and Never-Tell-a-Lie Washington clearly tell us to be honest, and we listen because they’ve been deified—just like Gandhi. Nationalism encourages these kinds of treatments of historical figures. Some people are lifted up, some are pushed down, and others are completely ignored. To a certain extent, those who are remembered become deities in a “civil religion”. The American civil religion glorifies the presidents, Civil Rights leaders, influential military figures, and many others. Lage Raho Munna Bhai shows that civil religion is not unique to America in existence or in practice—Gandhi is treated the same way that American figures are treated: his birthday is a national holiday; he is the moral standard for Indian existence; and in some cases, he is used to promote political agendas. Civil religion, then, is not necessarily just a national interest, but a global interest. This entry was posted in Relevance of Humanities, Religion in Culture, Student Blog and tagged civil religion, Deification, Emily Vork, Founding Fathers, Gandhi, Lage Raho Munna Bhai, REL 360 by admin. Bookmark the permalink.